The mainstream media told us last week's emergency landing of the American Airline plane in the Hudson river was due to bird-strike by a flock of Canada Geese. We can now reveal and prove, with photographic evidence from inside Iran sources, that the perpetrators of this event were not Canada Geese. These were undercover geese agents from Iran's Islamic SAVAK secret service, leading Pasdaran suicide terrorist geese, members of the Iranian Revolutionary Guard Corps, on their deadly mission. Their plan, masterminded in secret sessions by the Iranian terror mullahs, was for the suicide terrorists to down the American Airlines plane and to kill all passenger and crew members by throwing themselves into the air intakes of both plane engines at the same time. The assumption was that, robbed of all engine power, the pilot would be unable to glide the plane towards a safe landing but would crash in a densely populated New York. After infiltrating into Canada by air, the Pasdaran suicide geese and their Islamic SAVAK terrorist leaders disguised themselves as Canadians and slipped camouflaged as Canada Geese flock past stringent U.S. border control through the U.S.-Canada border. They rested near Detroit before taking on their deadly mission. With the Iranian secret service agents navigating the route, the suicide terrorist geese were led timely into the flight path of the American Airlines Airbus. When the navigators spotted the plane they gave signal for the Pasdaran suicide terrorist geese to dive into plane's air inlets. The attack succeeded as planed. Both engines were hit, the lunatic and very young Pasdaran suicide killers each found 72 virgins reserved for them (it is said they were disappointed that all those virgins were in their 80s) and the plane lost all power. But a miracle happened in the airspace of the United States of America and the heroic pilot manged to glide the plane into the Hudson without crashing. All passenger were picked up alive by New York harbor ferries. Unfortunately the secret service geese navigator escaped unharmed. Moon of Alabama has received irrefutable secret photographic evidence from inside Iran that shows extremist-Islamic Iranian mullahs supervising the training of the Pasdaran suicide terrorist geese and indoctrinating them before sending them onto their deadly mission. Now we all need to ask how long will it take President Obama to follow up on this new indisputable evidence and order an all out attack on these lunatics Islamic mullah terrorists and their 80 million (minus Parviz (btw - thanks for the pic)) Iranian supporters? "How long will it take President Obama to follow up on this new indisputable evidence and order an all out attack on these lunatics Islamic mullah terrorists and their 80 million (minus Parviz) Iranian supporters?" And damn, your insider scoop destroys my earlier assertion that Iran ceased all suicide bombings in 1988 and that it's only the Sunnis who are doing it. b!!! you are a genius. b: very very funny, but with due respect to Canadians, it's Canada geese. All of them. If he can find them. How are they disguised now? What did the mullahs think up? They camouflage them as Dodos? Bomb Australia! @Don - thanks, now corrected. Oh my God! Thats like The Loch Ness Monster times two. You don't suppose the Iranians are behind that too? The evil bastards will stop at nothing will they. Back in reality land, new resource issue that crushes any talk of a Palestine state. Big gas strike offshore Israel. Gaza would have a claim on that gas. ENDO Palestino. 1:36PM Isramco, Inc. announces a natural gas discovery at the Tamar prospect in the Matan license (ISRL) 46.34 +12.34 : Co announces a natural gas discovery at the Tamar prospect in the Matan license, offshore Israel. Formation logs identified more than 460 feet of net pay in three high-quality reservoirs. The thickness and quality of the reservoirs encountered were greater than anticipated at the well location. Noble Energy (NBL) operates the well with a 36% working interest. Other interest owners in the well are Isramco Negev 2 with 28.75%, Delek Drilling with 15.625%, Avner Oil Exploration with 15.625% and Dor Gas Exploration with the remaining 4%. On January 18, Noble Energy announced, "Early indications are that the resources identified are very substantial, at least equal to our pre-drill estimated gross mean resources of over three trillion cubic feet. Subject to the collection of additional data, the resource estimate for Tamar could further increase." Production testing at Tamar will be performed after the well is completed. Noble Energy and its partners may retain the rig to drill up to two additional wells in the basin. Pending positive test results, one well could be an appraisal at Tamar. In addition, the partners are considering drilling a second subsalt, lower Miocene prospect. Isramco, Inc. owns a 1.4375% overriding royalty interest before payout and a 2.7375% overriding royalty interest after payout in the license area. Isramco, (ISRL), together with its subsidiaries, engages in the acquisition, development, production, and exploration of oil and natural gas properties in the United States and Israel. At December 31, 2007, its total estimated net proved reserves were 50,353 million cubic feet equivalent, of which 25,352 million cubic feet were natural gas reserves; 2,003 thousand barrels were crude oil; and 2,164 thousand barrels were natural gas liquids. The company was founded in 1982 and is based in Houston, Texas. Isramco has proved reserves of almost 116000 barrels of oil and 1.4 billion cu. ft. of gas. HOUSTON, April 2, 2008 /PRNewswire-FirstCall/ -- Isramco, Inc.
States for a total consideration of approximately $92 million. approximately 3.3 million barrels of oil and 18 BCF of natural gas. from a related party. <-- Who provided the other $54M for property acquisition? So how does an Israeli oil&gas shell-company with only 116,000 barrels of oil reserves claim a "market cap" of 92.48M and get a $54M bank loan to buy positional plays in depleted field, all this when their posted earnings are -$10.54M, and with no production or production equipment, how did they manage to lose -$10.54M? Because slush fund liquidity is sloshing around like oil in a supertanker right now! Bank of Nova Scotia, Canada's third-biggest bank by assets, agreed to sell $200-million (US$167.3-million) of preferred shares, the fourth Canadian lender this week to "boost capital" to meet reserves requirements amid a recession. So $167M sale of preferred shares, and here BNS just lent $54M of their depositors' life savings to an Israeli shell company, tha'ts $-10M in the red, this last April!? That would be junk finance with investor savings and CDs, and those bank officials would be put in prison for fraud, if this were the world the MSM portrays it to be. You must be an Islamic spy in disguise, given the task of changing the subject of the thread. It's about goose-terrorism, not oil contracts. Clever, these Mullahs. b, How are they disguised now? What did the mullahs think up? They camouflage them as Dodos? Occasionally they are shaved (which requires a religious Fatwah) to make it looked as if their goose is cooked, then when you try and take a bite, wham, it's YOUR goose that's cooked! More to the point, how did Isramco (ISRL) structure a $54M loan presentation to Bank of Nova Scotia using a "third party reserve report" alleging 3.3MBBL's of oil at $100/BBL = $330M and $18BCF of gas at $10TCF = $180M, for a claimed valuation in April of $510M, but somehow ISRL was only paying $102M for these "proven" reserves? That would assume a long-term oil price of only $20 a barrel, and long-term gas price of only $2/TCF, right in the midst of the 2008 oil price hysteria, with Peak Oil predictions, at that time, of oil reaching $200/BBL, and gas reaching $20/TCF. Something stinks on ice here! I'll bet ISRL's claimed "matching-investment from a third party" was the oldest con in the world! Exactly the same con Bernie Madoff used to skunk all his investors! Maybe that's why Bank of Nova Scotia is selling $137M in preferred shares today, because they realized they just got hosed by the ISRL's. How much of this new ISRL gas strike claim is estimated by "third party reserve reports", claims being used by "wealth managers" to pump-and-dump ISRL up to $60? 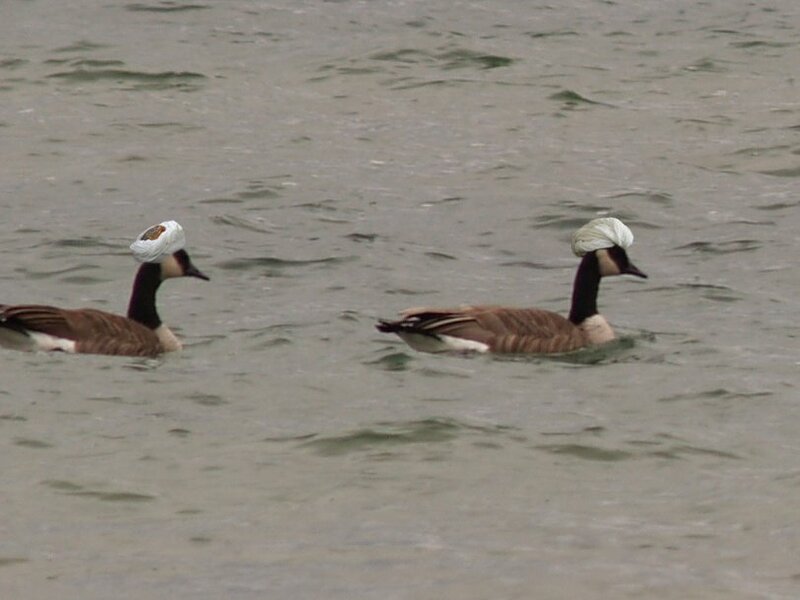 The terrorist geese plan on cooking america's goose by donning new disguises- bald eagles and turkeys. These fowl enemies are not only trained for suicide attacks on planes but are also notorious for their used of bombs containing biological agents against civilian populations. Remember to "Be A Lert" and don't let their birdbrains fool you, these are not feathered friends but warriors dedicated to their missions. Yes, but what happened to the pod of Shi'ite suicide dolphins who were supposed to attack the passengers debarking from the downed plane? A friend sent me the following, I really thought it was a joke..
Art therapy with ex-jihadists, featuring art therapist Dr. Awad Alyami in Saudi Arabia. See PBS Thirteen Net New York at pbs.org for complete information. ...... I just learned the IRGC geese were on a practice run in preparation for asymmetric drone warfare. The Israelis don't know what's gonna hit them, as they fly F-14 formation with titanium clasps on legs/neck to confuse Israeli radar. I'd like to be a fly on the wall when the israeli radar picks up the "plane" only to have it break into pieces as the geese fan out after crossing into israeli air space. Rumor has it the IRGC has been eating the goose version of mexican food to prep for this mission. Parviz-thanks for the humor, I'm surprised the MSM has yet to notice these developments and report them.